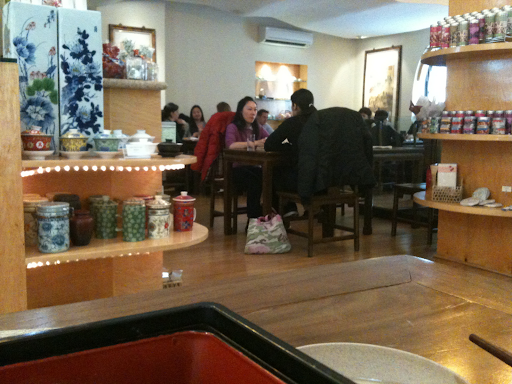 My office is not far from Radiance Tea House, but I don't often get a chance to visit since it requires a lengthy lunch. It had been awhile since my last visit, and I was in need of a restorative lunch. I ended up going in the middle of prime lunch time, so the place was packed and fairly loud. I was seated at a long table in the back, which was actually a little bit quieter since it is separated from the main dining area. I ordered dumplings for lunch, and then focused on the tea. I wanted to try something new, so I picked a raw pu'erh. I hate to admit it, but I've only had pu'erh once before, years ago. It was of questionable quality, and I did not enjoy it. It was time rid of that memory, and I knew this was a great place to do so. I decided to try the Seven Sons Raw Pu'er because it sounded sweet yet complex. The tea arrived with the leaves in a strainer next to the pot. The wet leaves smelled very sweet, and were slightly earthy. The liquor was golden yellow. It was malty and smooth, with a predominant honey flavor. I was also getting an interesting taste of something that reminded me of the smell of a new leather jacket. Also rich earth after a heavy spring rain. The background tasted like an herb shop in Chinatown, in a good way. Interesting that the smell of the tea was so different than the taste. The second brew was less smooth, and very earthy. It had a tannic taste that was stronger and more complex than the initial brew. Such a great experience! I wish I could have taken the leaves with me for a few more infusions. But since they were making an entire pot with each brew, I didn't have time for more. I am definitely going to start drinking more pu'erh. There are many different types, and I look forward to the journey. If anyone wants to recommend the next one to try, please feel free to do so. One day I hope to take my daughter to Radiance, instead of one of the girly, toursity tea places that families usually frequent. I think she'd love the food and the friendly staff here. And she always loves stealing sips of my tea. Radiance continues to be a true gem in Midtown. I will try to get back very soon!